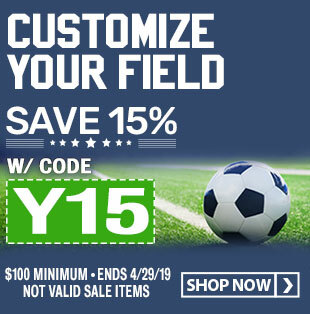 These triangular markers have a solid polyfoam body and weighted base with rocket red covers for visibility and stability. The chain gang vests are made from vinyl nylon with elastic velcro straps for easy adjustments. Easily identify the end zone with these orange vinyl nylon stand-up pylons that stand strand at 18" high. 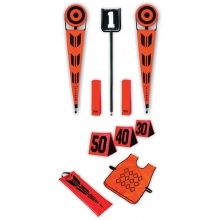 These target markers are bright so that it can guide players to the first down position.This package includes: flip indicator, varsity chain set, (11) sideline markers, (3) vests, deluxe pylons (3 sets, 12 total), and (2) target markers. This Fisher chain set package is what your football teams needs to start the season because it is durable, safe and meets all NCAA and NFHSA regulations. To protect players, the bullseyes are made with a 4" thick polyfoam and the bottom of the poles have crutch tips. The down indicator is constructed from a 7' galvanized steel pole wrapped in 3/4" thick closed cell foam to ensure durability and safety. For easy visibility, the 7'H flip indicators have a 12" tall 1 color number and are padded for safety.